Happy Holidays GYCT Readers! To celebrate the holidays and to celebrate all our great readers and fans, we wanted to make some special projects just for you. 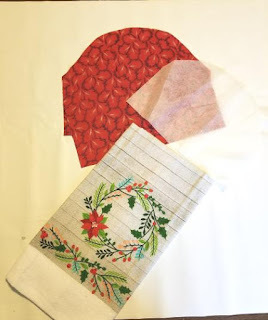 Today we wanted to share a free hanging dish towel pattern to say Thank You. We love our readers and love to share fun free patterns. But really, I swear the baby walks by the oven and dishwasher just to swipe my towel and run. I can't keep a towel in my kitchen to save my life. Which means I go through way more towels then I want. And when I'm in the middle of my Fall Deep Cleaning I don't need anyone swiping my towels. But not anymore!! Nope!! Now that towel is fastened to the oven handle and they could pull for days and it isn't going ANYWHERE! Which is why I had to share this hanging dish towel pattern. I know I'm not the only one that needs some way to keep their towels in place. 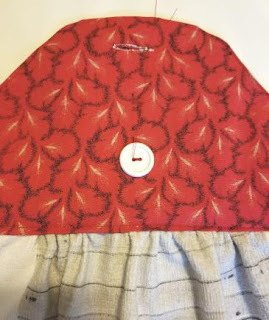 Yes, I know there are other hanging towel patterns out there, but this one is super simple, super fast and you don't even have to add a button, you could do a snap!! Minimal sewing but maximum results. 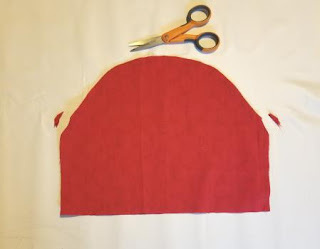 And you only need some scrap fabric and a dish towel to get started. 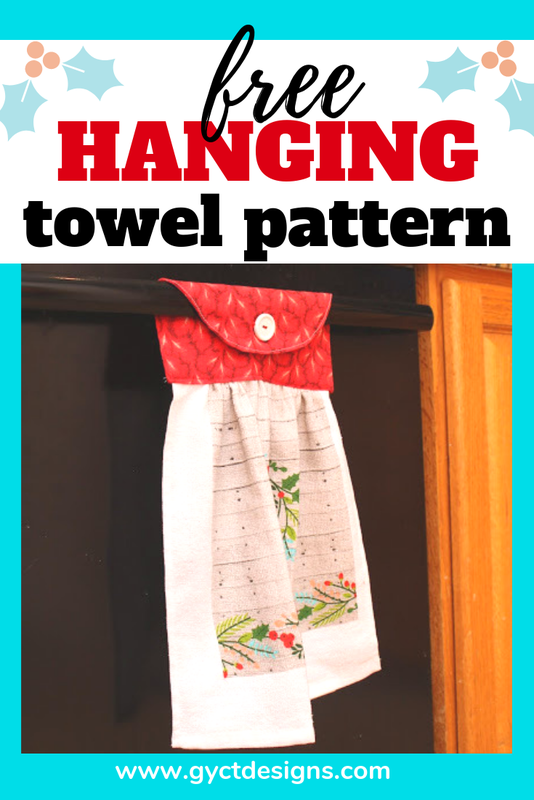 This hanging dish towel pattern could change your life! You could make a towel for every holiday. Or make them so they match your kitchen or bathroom. AND they won't disappear from your kitchen. They also make great gifts, promise. I give them away a lot, especially to Mom's of toddlers. No ones complained yet. And the best part, this little towel only cost me about 45 cents! Yes, that is right, not even a dollar. It's the gift that keeps on giving. 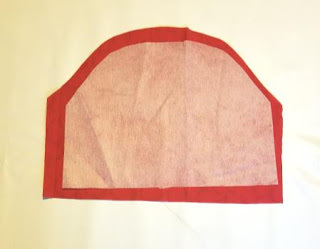 Using your pattern piece, cut out 2 pieces in main fabric and 1 interfacing piece. Take your hand towel and cut it in half. 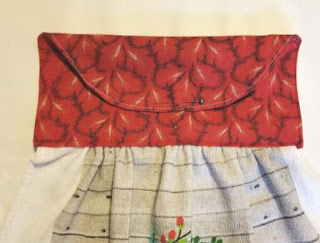 Press or stitch your interfacing to the wrong side of one of your towel topper pieces. Place your 2 towel toppers Right Sides Together (RST). Stitch around the topper leaving the bottom straight edge open. Clip your corners and around your curved edges. Place gathering stitches along the top edge of your towel. Pull gathering stitches until the towel is the same width as the topper. Place towel inside topper and pin in place. 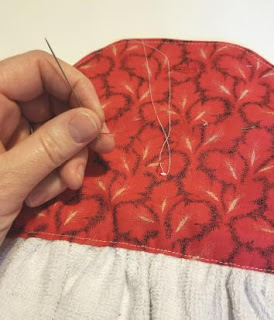 Stitch across the towel topper, closing the opening and stitching the towel in place. 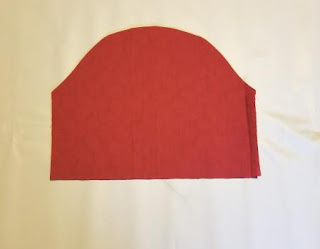 Fold the top edge of the topper over towards the front of the towel. 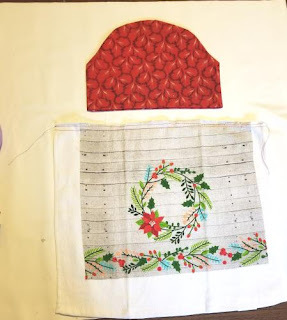 Find where you’d like to place your button and buttonhole. Mark. Stitch buttonhole. Tip: Your buttonhole should be ¼” wider then your button. 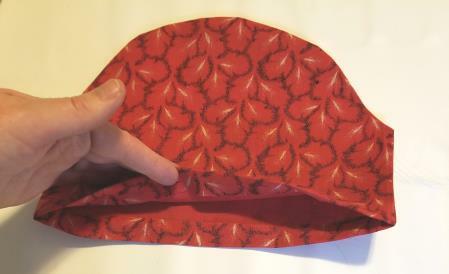 Stitch button to topper. Make sure the button is centered under the buttonhole. Tie off the button at the back of the towel topper. There you have it. 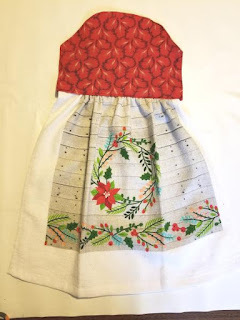 A super quick and easy pattern for the holidays or just every day. I plan to make myself like 10 of these just for my kitchen. And maybe a few for the bathrooms since those towels tend to end up on the floor. 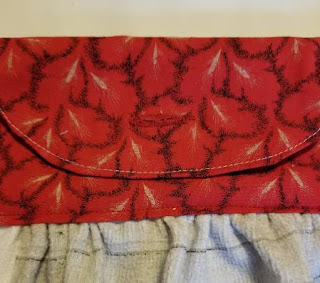 If you are looking to see exactly how I sew one up, watch me make the hanging dish towel pattern and our Fox Coin Pouch. I show you how easy assembly is and you can see some of our other fun Christmas gift ideas as well. Since this is a free pattern, like always just sign up for our GYCT Subscriber Library and you can download the free PDF pattern. Not sure you want to sign up? You'll have access to all of our free patterns, printables and SVG cut files. If you enjoy sewing and crafting, you'll love our library. And we are always adding new free products.